Call for Presenters now open! ECTN Awards 'Destination of Sustainable Cultural Tourism' 2014 - 2019 ! Veneto Region, Italy, has joined ECTN as a member, following successful cooperation in ECTN projects CHARTS INTERREG IVC (2012-2014), CHRISTA Interreg Europe (2016-2020) and Cult-CreaTE Interreg Europe (2018-2022). 2) promoting tourism development that encourages cultural interaction and ensures the benefits are shared by all communities involved. 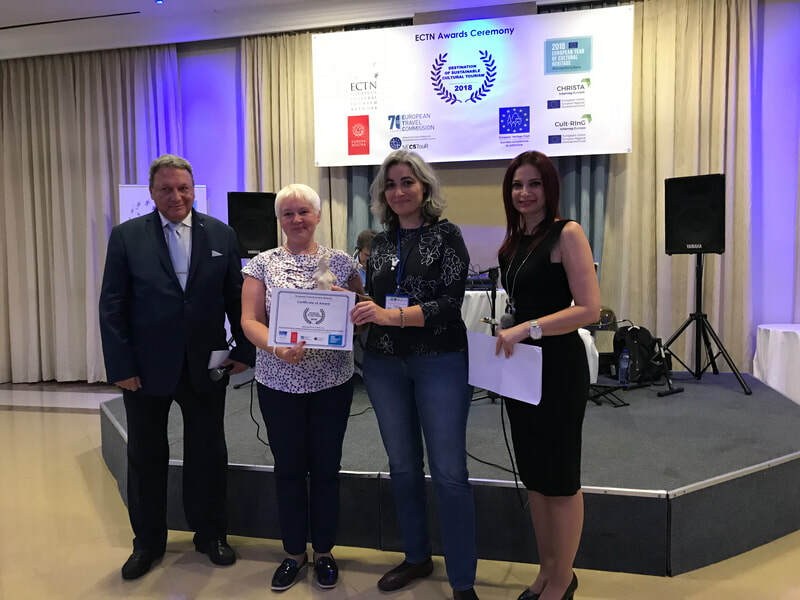 Former European Commissioner for Culture Mrs Androula Vassiliou, currently Vice-President of Europa Nostra was confirmed as Honorary Member of ECTN at the closing ceremony of the ECTN annual Conference, in Pafos, Cyprus, on 26 October 2018. Mrs Vassiliou had been proposed as ECTN Honorary Member during her term as EU Commissioner for Education, Culture, Youth and Sport, as a recognition of her contribution to cultural tourism in initiatives such the European Heritage Label and her video message at the 2013 ECTN Conference. Winners of the ECTN Awards 2018 announced! 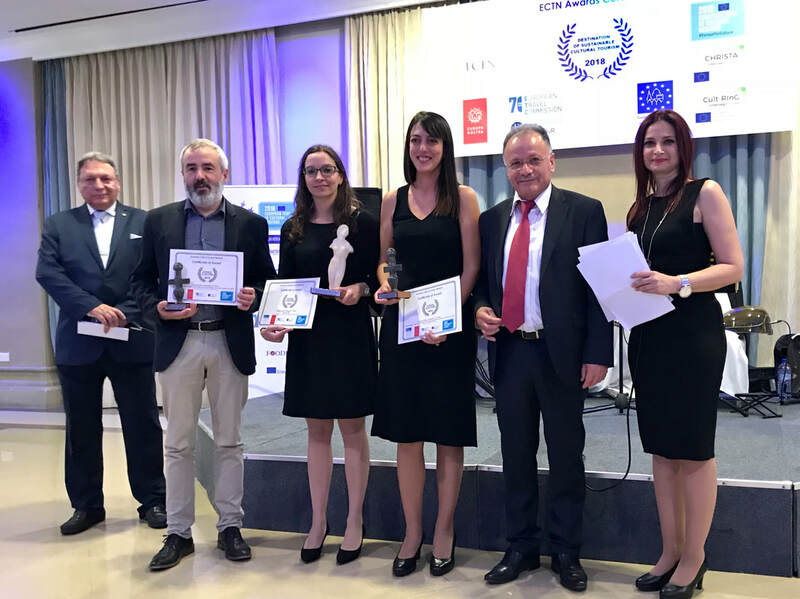 The ECTN 'Destination of Sustainable Cultural Tourism 2018' Awards were announced at a ceremony on 25 October in Pafos, Cyprus. 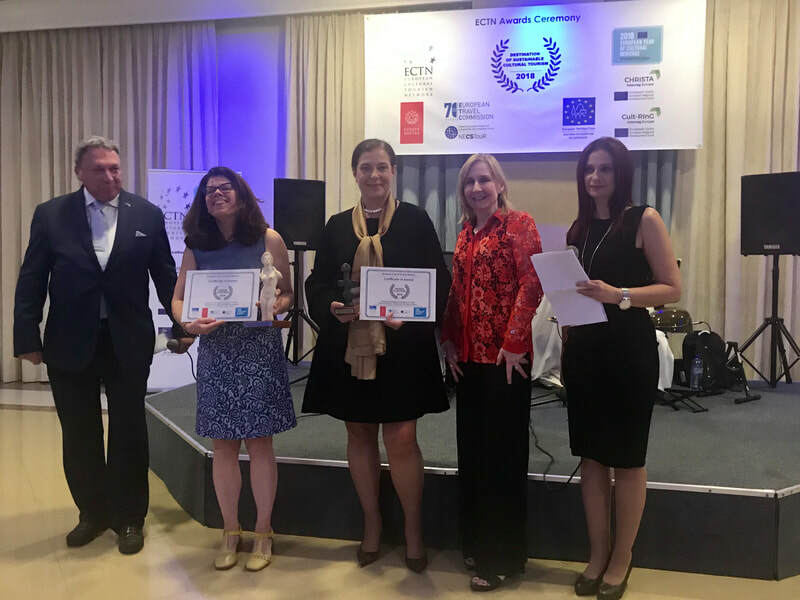 The ECTN Awards for 2018 have been held in cooperation with Europa Nostra (EN) and the European Travel Commission (ETC), supported by NECSToUR, as a contribution to the European Year of Cultural Heritage 2018 (EYCH2018), initiative on 'Tourism and heritage: responsible and sustainable tourism around cultural heritage'. In total 57 candidates from 15 countries had submitted applications, under 7 thematic categories. The selection has been made by a jury comprised by representatives of ECTN, EN, ETC and NECSToUR. 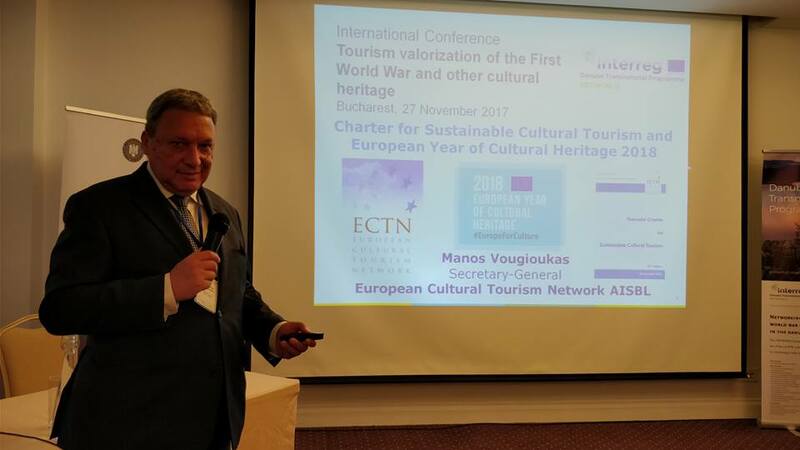 This event included the launch of the ECTN "Charter for Sustainable Cultural Tourism" 3rd edition, in relation to European Year of Cultural Heritage 2018 (EYCH2018) initiative on "tourism and heritage", as well as the results of the CHRISTA Interreg Europe project and pliot actions under way. The CHRISTA project aims to protect and preserve European natural and cultural heritage assets and deploy them for the development and promotion of innovative, sustainable and responsible tourism strategies, including interpretation and digitisation. This event presented the interim results of the Interreg Europe Cult-RInG project in terms of the value of investment in European Cultural Routes in terms of their contribution to growth and jobs and the development of new cultural routes. 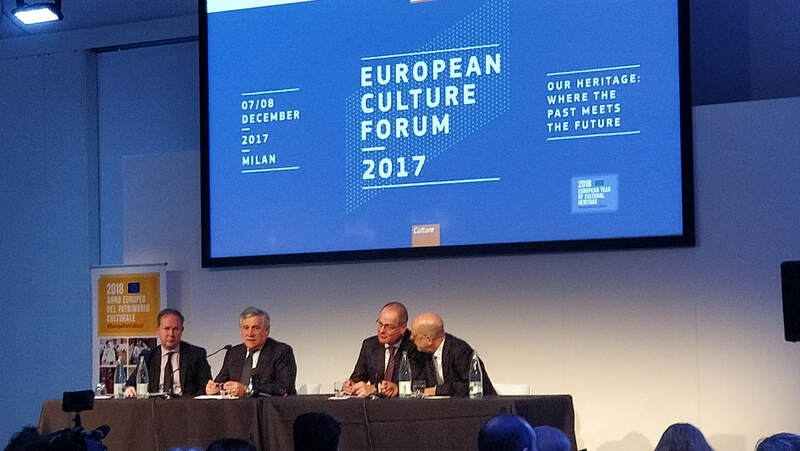 The event was in the frame of the European Year of Cultural Heritage 2018 (EYCH2018), initiative on "tourism and heritage". The work is a part of the Cult-RInG project, under external expertise, in order to help achieve the project communication and dissemination objectives and to facilitate the policy learning process, by the production of a creative video documentary of the project aims, activities, outputs and results, with specific focus on experience of existing cultural routes, capitalisation of good practices and development of new cultural routes. Deadline for submission of offers by email: 31 October 2018 24:00 CET. as a contribution to European Year of Cultural Heritage 2018! ECTN will launch a competition with prizes for a Video Clip on the theme of Cultural Tourism development and promotion in Europe. This competition is in the frame of EYCH 2018, European Initiative on 'Tourism and heritage: responsible and sustainable tourism around cultural heritage'. Further details to follow soon! ECTN welcomes the European Capital of Smart Tourism initiative! In line with a preparatory action proposed by the European Parliament, the European Commission is launching a competition to award the title of European Capital of Smart Tourism. This brand new initiative rewards European cities and gives them the opportunity to share their exemplary practices as smart tourism destinations. Deadline for applications is 30 June 2018. 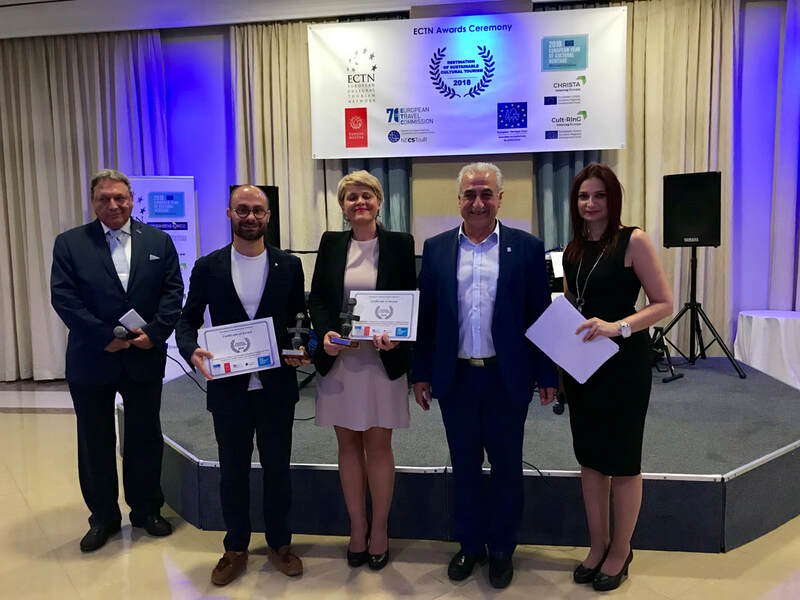 Two cities showing the most intelligent, innovative and inclusive solutions in all the above mentioned areas will be awarded the title of “European Capital of Smart Tourism 2019”. 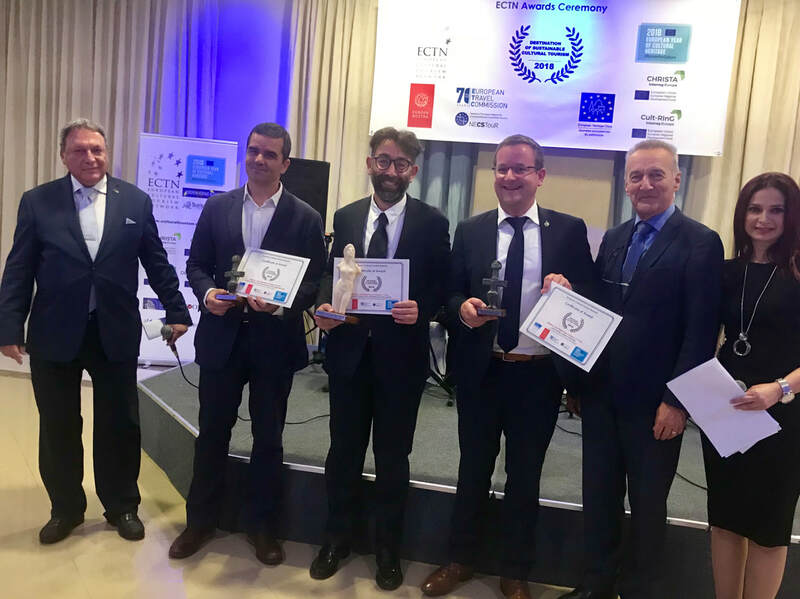 Additional four cities will receive European Smart Tourism Awards for their outstanding achievements in the individual categories listed above. ECTN welcomes and supports this excellent initiative, particularly since the areas of Sustainability, Cultural Heritage & Creativity are directly related to ECTN's role in promoting Sustainable Cultural Tourism in Europe, as well as 'Accessibility to Heritage' being a good practice already included in the ECTN Charter for Sustainable Cultural Tourism. ECTN urges all its eligible members to apply. ECTN in new Interreg Europe projects! ECTN is a partner in a new Interreg Europe project approved by the monitoring committee, one of 54 projects approved out of 234 applications received in the third call for project proposals. 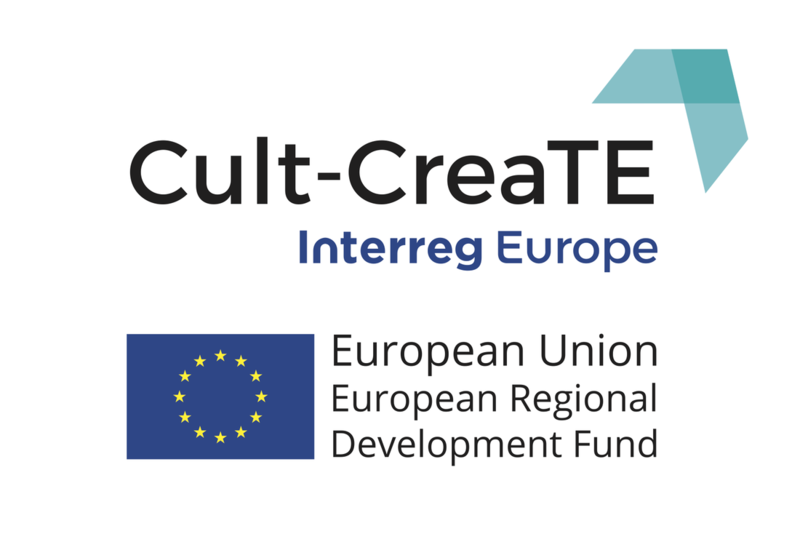 ​Cult-CreteTE (Cultural and Creative Industries contribution to Cultural and Creative Tourism in Europe) aims to redeploy Cultural and Creative Industries (CCIs) for the development and promotion of Cultural and Creative Tourism (CCT) strategies, with sustainability, innovations, capitalisation, policy learning, policy implementation and capacity building. Cult-CreteTE is led by Vidzeme Tourism Association in Latvia, with partners Veneto IT, Nicosia CY, Cork IE, Dundee UK, Naoussa EL, Pecs HU, Kujawsko-Pomorskie PL. responsible travel with efficient & sustainable tourism development, for transition to a low-carbon economy, through efficiency, resilience, multimodality, novel low-carbon transport systems, cycling & walking, with implementation innovations, policy learning and capacity building. Both of the above topics, CCIs for CCT and SMART Destinations, are included in the ECTN 'Charter for Sustainable Cultural Tourism', which is a contribution of ECTN to the European Year of Cultural Heritage 2018. "Heritage Interpretation for Sustainable Cultural Tourism Policies: Interreg Europe CHRISTA Project"
Tibor Navracsics, EU Commissioner for Education, Culture, Youth and Sport opened the conference in the Knight's Hall of Jurisics Castle in Kőszeg. Deadline for submission of offers by email: 9 March2018 24:00 CET. A Joint Meeting on the preparation of the CHRISTA Action plans took place in Granada, Spain, with the participation of all CHRISTA project partners and their experts. ​The meeting was opened by Ms Ana Muñoz Arquelladas, deputy of the delegation of employment and sustainable development of Diputacion de Granada and by Mr Michalis Pavlidis, Mayor of Geroskipou in Cyprus, on behalf of the CHRISTA lead partner Pafos Regional Board of Tourism. Both Diputacion de Granada and Pafos Regional Board of Tourism are members of ECTN, also represented on the ECTN Board. ECTN is providing expertise on guidelines for the CHRISTA action plans. ECTN had been invited by the European Commission DG GROW to to the official opening of the 2018 EU-China Tourism Year (ECTY) on Friday 19 January 2018 in Venice, at the Doge's Palace and the ECTN Secretary-General participated. The ECTY was announced jointly in July 2016 by the President of the European Commission and the Chinese Prime Minister. It aims at increasing the investment opportunities in China for European operators and boosting European growth and jobs by promoting Chinese tourism to the EU. ECTY was launched by Commissioner Bieńkowska and the Chairman of China National Tourism Administration. 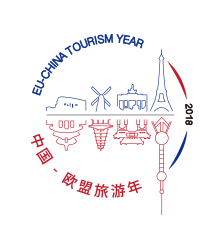 ​ECTN is ready to contribute to ECTY 2018, in terms of responsible and sustainable cultural tourism which is highly relevant to both EU and China tourism sectors. ECTN is also facilitating synergies between ECTY 2018 and EYCH 2018, as the only member of the EYCH 2018 Stakeholders Committee with a tourism mandate. ECTN Secrtary-General Manos Vougioukas, Europa Nostra Vice-President Piet Jaspeart and European Travel Commission (ETC) Director-General Eduardo Santander at the launch of the EU-China Tourism Year 2018, Palazzo Ducale, Venice, 19 January 2018. On the right, the European Commissioner for Tourism Ezbieta Bienkowska. 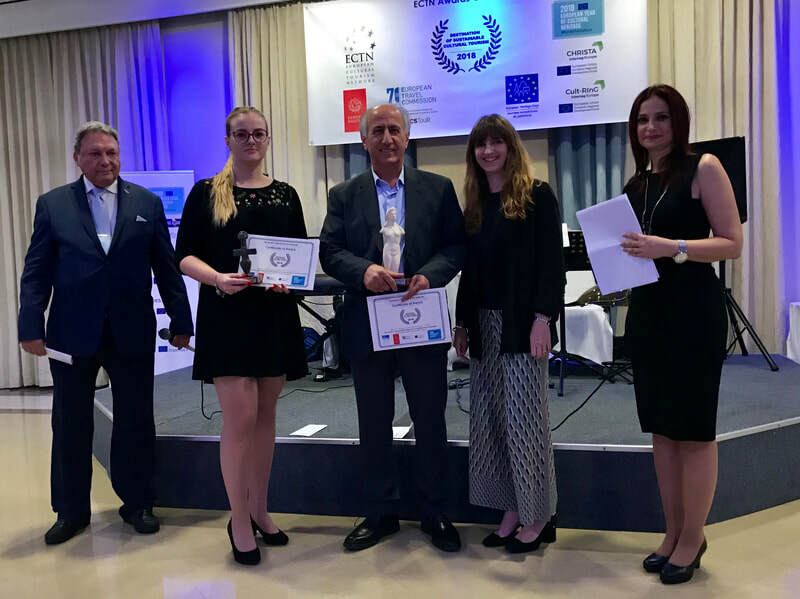 ECTN, Europa Nostra and ETC are cooperating in the Award for Sustainable Cultural Tourism Destinations in 2018 in the frame of the European Year of Cultural Heritage 2018. The work is a part of the CHRISTA project, under external expertise, in order to help achieve the project communication and dissemination objectives and to facilitate the policy learning process, by the production of a creative video documentary of the project aims, activities, outputs and results, with specific focus on Intangible Heritage, Industrial Heritage, Interpretation facilities and Innovation/Digitization, for Sustainable and Responsible Cultural Tourism development and promotion. Deadline for submission of offers by email: 23 February 2018 24:00 CET. ECTN as advisory partner of CHRISTA project in the Interreg Europe programme, intends to commission an external expert that will provide technical assistance to the project partners in the drafting of the Action Plans. Deadline for submission of offers by email: 19 January 2018 24:00 CET. A VERY HAPPY AND CREATIVE 2018 - EUROPEAN YEAR OF CULTURAL HERITAGE ! 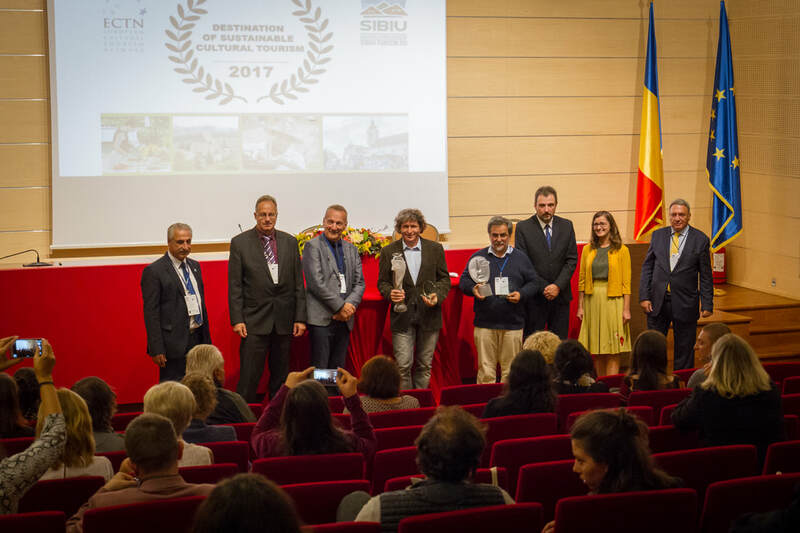 Awards contest for 2018 'Destination of Sustainable Cultural Tourism' launched at EYCH 2018 Stakeholders and National Representatives joint meeting and at the European Culture Forum 2017, in Milan, Italy, in partnership with Europa Nostra and the European Travel Commission and as a contribution to European Year of Cultural Heritage 2018 ! 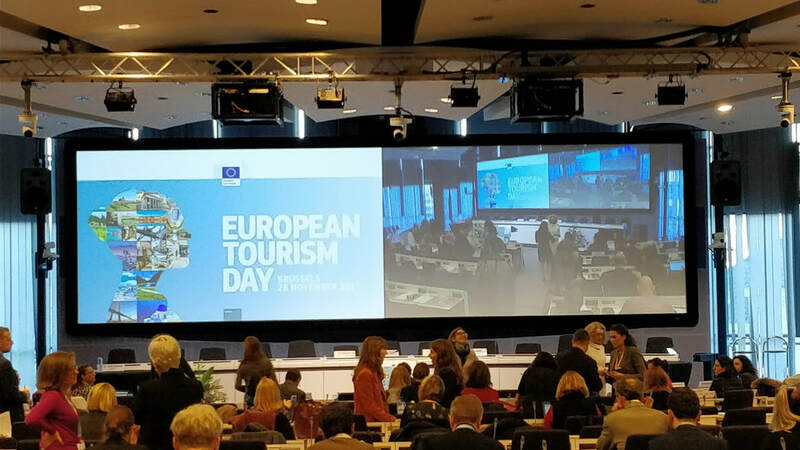 ECTN participated in the 2017 edition of the European Tourism Day on 28 November in Brussels, organised by the European Commission. This year the conference addressed the topic of "The future of EU tourism" and will look into issues such as access to finance under the next EU Multi-Annual Financial Framework, the tourism value chain and its implications on consumers, businesses and local communities as well as the future of tourism governance at EU, national and regional level. The event gathered up to 400 participants, including Commissioners, other representatives of the European Commission and high-level representatives of public authorities at EU, national and regional level. We’ll also line up representatives of prominent European sector associations, the tourism and travel industry as well as other relevant stakeholders. Representatives from Granada County Council (Diputación Provincial de Granada) - Spain, and from Västra Götaland Region (Västra Götalands Regionen) - Sweden, have been elected to join the Board of ECTN. 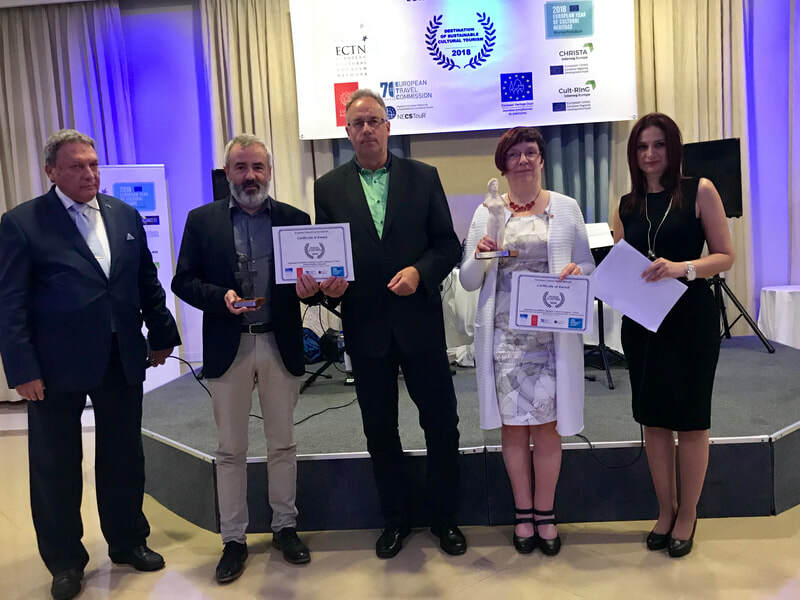 ​They join the existing Board members, representatives from Vidzeme Tourism Association - Latvia (President), Pafos Regional Board of Tourism - Cyprus (Vice-President), Sibiu County Tourism Association - Romania, CIM Ave - Portugal, and Dubrovnik City Development Agency DURA - Croatia. Interreg Europe project CHRISTA (Culture and Heritage for Responsible Innovative and Sustainable Tourism Actions). The United Nations 70th General Assembly has designated 2017 as the International Year of Sustainable Tourism for Development (IY2017), which is a unique opportunity to raise awareness on the contribution of sustainable tourism to development among public and private sector decision-makers and the public, while mobilizing all stakeholders to work together in making tourism a catalyst for positive change. IY2017 aims to support a change in policies, business practices and consumer behaviour towards a more sustainable tourism sector, facilitated by UNWTO. European Cultural Tourism Network joined the celebrations of the International Year by promoting tourism`s role in the key area of ‘Cultural Values, Diversity and Heritage’, one of the five key areas of the IY2017. ECTN organizes an international conference since 2005 on a theme related to cultural tourism in a different country every year. For the past 4 years, the annual conference is organized in the frame of ‘European Heritage Days’ and ‘European Cooperation Day’. Our 2017 Conference theme was dovetailed with the UN IY2017 and took place within IY2017 activities. The 10th international conference ‘Cultural Values, Diversity and Heritage: Pillars of Sustainable Tourism for Development’ discussed the latest trends in the field of cultural values, diversity and heritage towards sustainable tourism for development, including innovation, creativity, R&D and sustainable tourism product development. The conference explored major challenges, risks and opportunities for sustainable and responsible tourism development related to cultural values, diversity and heritage, as well as suggest practical steps for the development and marketing of cultural tourism products and services. ECTN as a signatory of the ‘European Tourism Manifesto for Growth & Jobs' has included this Conference in the Manifesto Working Programme 2017. The conference was organised in close cooperation with Sibiu County Tourism Association and in conjunction with the Interreg Europe project CHRISTA – Culture and Heritage for Responsible, Innovative and Sustainable Tourism Actions (2016 – 2020). European Parliament Conference “A European strategy to enhance the competitiveness of the tourism industry, a key driver for job creation”, in Brussels on 27 September, International Day of Tourism. ​The event was opened by European Parliament President Tajani, with the participation of Vice-President Katainen, the responsible Commissioners, the Chairs of the TRAN, IMCO and CULT parliamentary committees, leading MEPs, as well as the Presidents of the Economic and Social Committee and the Committee of the Regions, senior representatives from the European Investment Bank and other leading stakeholders. 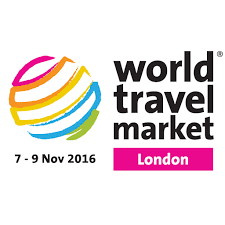 · Promoting Europe as the number one tourist destination. ECTN presented the Charter for Sustainable Cultural Tourism at the ﻿﻿Visitor Economy Conference at Bournemouth University﻿﻿, on 5 September 2017. EYCH 2018 Stakeholder Committee 1st Report published ! ​​TENDER for subcontracting external expertise regarding policies on INTERPRETATION FACILITIES for SUSTAINABLE and RESPONSIBLE TOURISM in the scope of Interreg Europe programme project CHRISTA. TENDER is CLOSED! To receive Tender Specification and Proposal Form, potential Applicants should send a request to email: coordinator(at)culturaltourism-net.eu. 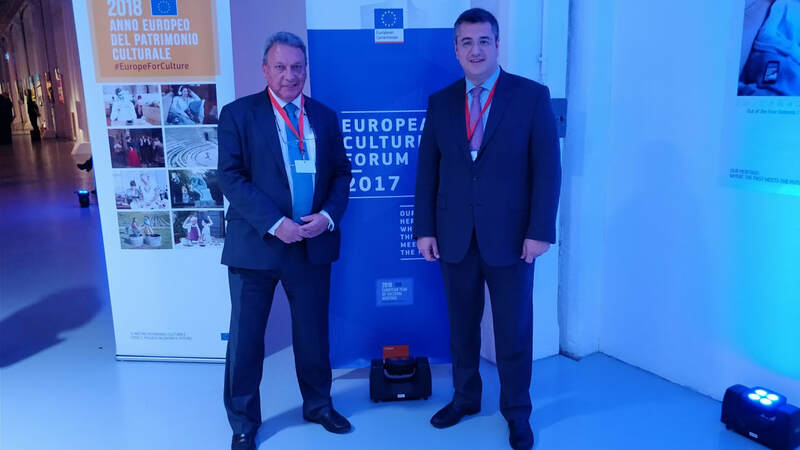 ECTN Secretary General Manos Vougioukas has been selected in the programme of the symposium 'The Future of Tourism in Europe: Promoting Competitiveness Through Sustainability and Digitisation' on the initiatives to promote Europe’s Cultural Heritage in Brussels on 4 July 2017. ECTN participates in a high-level event of European Parliament and UNWTO on 'Connecting Europe through Innovations' in Madrid on 24 March 2017. We are happy to announce that ECTN Award 2017 for cultural tourism in Europe is OPEN! Read more HERE and APPLY ! We are pleased to announce that our ECTN Messenger No. 3 is published. In this issue, we feature many good news and activities happened during the second half of 2016 with the network and its members. We believe this information will be interesting and useful for You. ECTN joins the celebrations for the UN International Year of Sustainable Tourism for Development 2017! 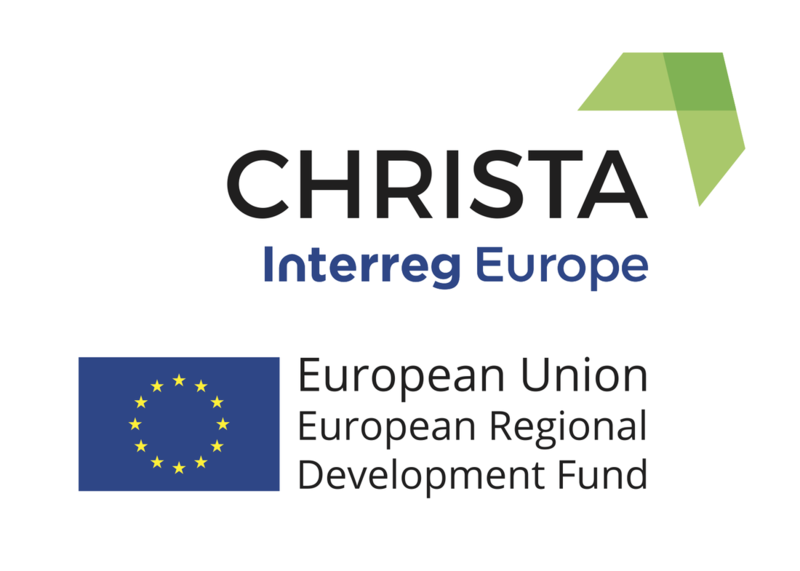 ​​TENDER for subcontracting external expertise regarding policies on INDUSTRIAL HERITAGE for SUSTAINABLE and RESPONSIBLE TOURISM in the scope of Interreg Europe programme project CHRISTA. TENDER is CLOSED! 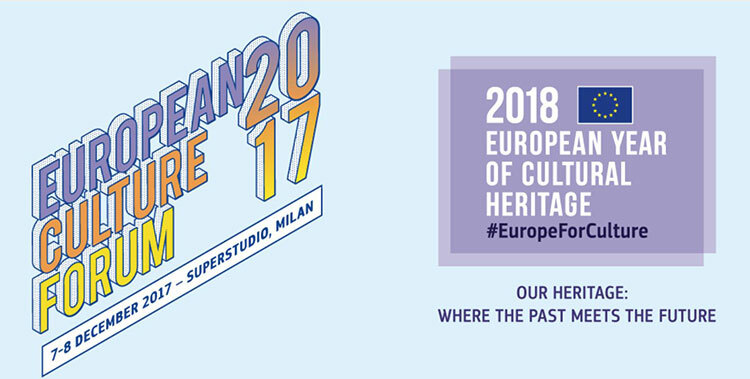 37 European and international heritage networks, that are part of the European Heritage Alliance 3.3, including ECTN, have sent a joint letter calling on 28 EU Heads of State or Government to fully support the European Year of Cultural Heritage in 2018, and especially to allocate adequate financial resources to the implementation of the Year. Members of the Alliance also urge the EU Heads of State or Government to seize the historic opportunity of the event marking the 60th anniversary of the Treaty of Rome on 25 March 2017 to publicly recognise that the entire European project has a wider cultural meaning and significance derived from our shared cultural heritage, both tangible and intangible. Read the full text of the letter with the list of signatories HERE. 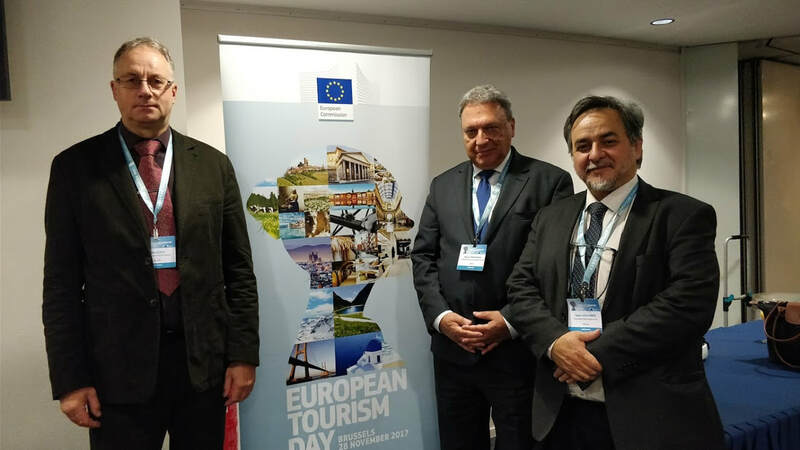 ECTN Secretary-General Manos Vougioukas made an intervention at the European Tourism Day event in Brussels on 29th November 2016. 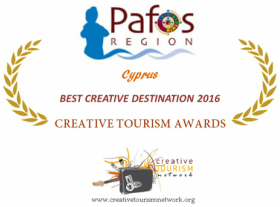 We are pleased to inform that Pafos Region – Cyprus (ECTN Vice-Presidency) received the Creative Tourism Award 2016: Best Creative Destination. 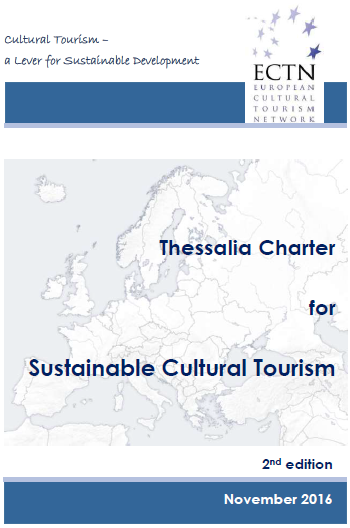 Creative Tourism is included in the new version of THESSALIA CHARTER, to be launched in Brussels, during a special workshop on 30 November 2016. In the 1st edition of CHRISTA newsletter you can find more information about the project, partnership, how CHRISTA project was created, events organised between May and September 2016, as well as plans for the next 6 months. CHRISTA VOICE is available at the CHRISTA Library. Our project proposal Cult - RInG is APPROVED! 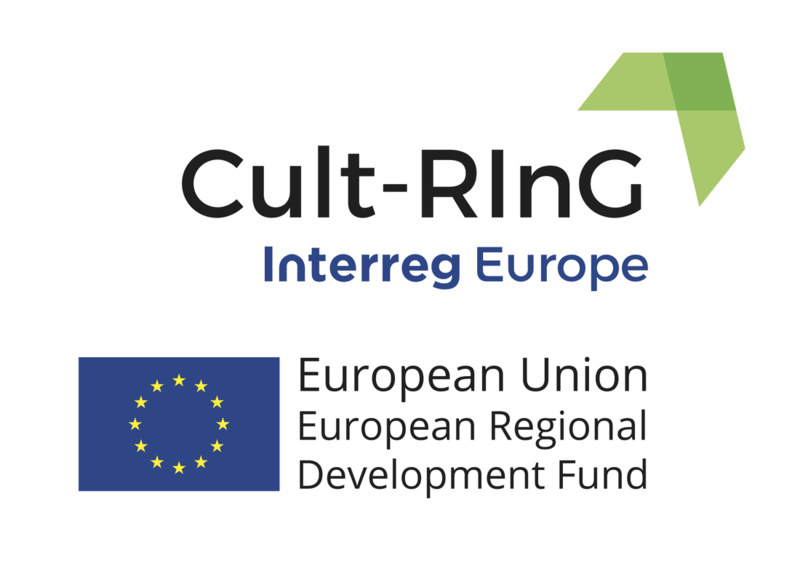 We are very happy to inform that project proposal Cult-RInG - Culture Routes as Investment for Growth and Jobs submitted in the 2nd Call of the Interreg Europe programme with ECTN as an Advisory Partner and our members as Project Partners from 6 destinations across Europe is APPROVED! List of the projects approved in the second call for proposals can be found HERE. 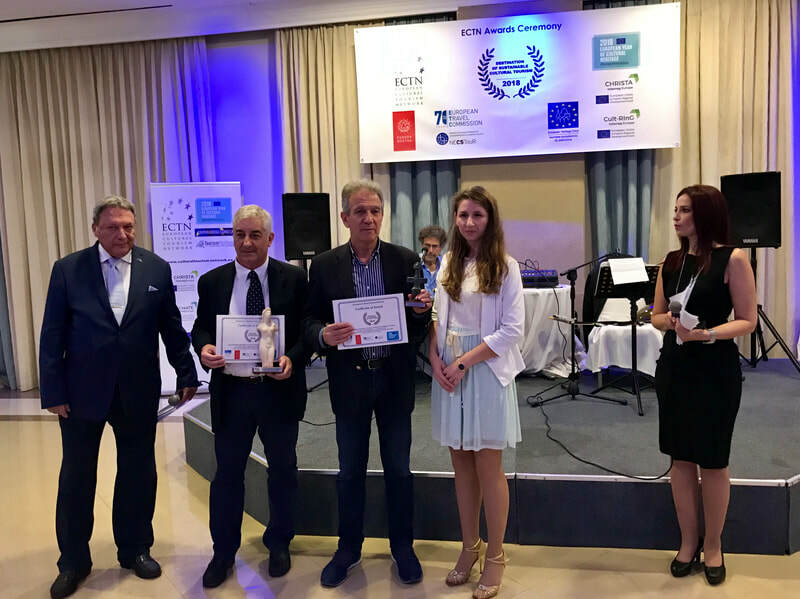 We are very please to report ​that South Pelion Municipality in Greece, the Lead Partner of the successfully completed INTERREG IVC project CHARTS and a previous member of ECTN in 2012-2014, has recently re-joined our Network as a destination member. South Pelion will be represented by its Tourism Committee, comprising elected representatives councillors, representatives of SMEs in the tourism sector and citizens. E-FAITH signed the Memorandum of Understanding and Cooperation with ECTN during the 2016 E-FAITH Weekend for volunteers and voluntary associations on theme ‘Industrial Heritage Tourism: the role of volunteers and local citizens’, which took place on 17—19 June in Antwerp, Belgium. ​Conclusions and the results of the meeting will be available HERE. ​​TENDER for subcontracting external expertise regarding policies on INTANGIBLE HERITAGE for SUSTAINABLE and RESPONSIBLE TOURISM. Tender Specification. Form.